Wrinkle Decreasing Treatments targets one of the underlying causes of frown lines and crow’s feet—the repeated muscle contractions from frowning and squinting over the years. Jayne our expert injector will treat these muscles with "Wrinkle Decreasing Treatments" to temporarily reduce muscle activity. You will begin to notice a visible smoothing of your crow’s feet lines and frown lines between your brows. Wrinkle Decreasing Treatments work beneath the skin’s surface and targets the underlying muscle activity that causes frown lines and crow’s feet. For the crow’s feet area, Jayne will inject 3 areas of the orbicularis oculi, the muscle that frames the side of the eye. This will be repeated on the orbicularis oculi muscle on the other eye. Injecting "Wrinkle Decreasing Treatments" into the muscles that cause crow’s feet lines temporarily reduces the activity of those muscles. The result is a reduction in the appearance of those lines. 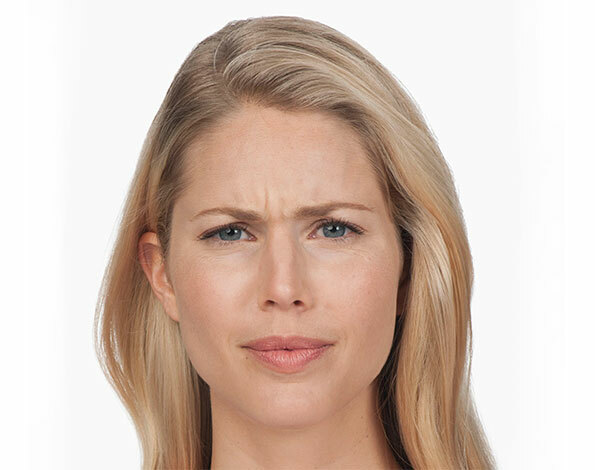 For the frown lines area, Jayne will administer 5 injections into muscles in your forehead—1 in the procerus muscle and 4 in the corrugator muscles. Injecting "Wrinkle Decreasing Treatment" into the muscles that cause frown lines temporarily reduces the activity of those muscles. The result is a reduction in the appearance of those lines. It is the patients impression of treatment that is of most important to them. That's why Jayne Expert injector at The Lip Queen will work with you to help you achieve your desired outcome. WE ONLY USE BOTOX BY ALLERGAN for PROVEN LASTING RESULTS. We pride ourselves on using only a small number of top end brand/prescribed products which are effective, long-lasting and safe prescribed only products. Teoxane HA fillers consists of several monophasic hyaluronic acid based products of non-animal origin, which are highly biocompatible, offering patients immediate and long-lasting results. Its high hydrating capacity can absorb up to 1000 times its own weight in water and is visco-elastic to maintain the skins elasticity and form a dense, interlocking mesh. The patented technology used in the Teoxane range has a reduced protein and bacterial endotoxin level resulting in less hypersensitivity reactions. Hyaluronic acid is completely broken down within the skin over a period of months, eventually leaving no trace of the filler. This HA filler is a highly viscous formula, and contains very high plumping power when used in the lips. Juvederm Vycross range offers proven longevity compared to other brands and has a smoother more comfortable natural look which enables you to retain facial expressiveness. The vycross range offers a whole new technology of hyaluronic acid cross linking and vary in concentration which means they are fabulous for other facial treatments available at The Lip Queen Clinic following consultation. Lips are often one of the most difficult areas to treat cosmetically, mainly due to their mobility – we use our lips almost constantly throughout the day whether it be talking, eating, or drinking – and their dense blood vessel network. This means that in order to cosmetically enhance them, they often require a product especially designed just for them. A consultation is indeed the most important aspect of your visit and Jayne will spend time with you in determining the best option for your lips by way of brand and quantity of filler. Lip augmentation is a very common procedure in the cosmetic world in any age group. Although the lips do get thinner and generally more lined naturally as we get older, many people are unhappy from a very young age with the appearance of their lips. Whether this be just because they are a little thin or otherwise, lip filler provides a great solution and Jayne will always be honest with you regarding your expectations and outcomes. As hyaluronic acid is specifically designed for use in the lips, it is highly cross linked. This results in the gel within the treatment being substantially more resistant to being broken down. Resistance to being broken down means that some filler can last an optimal life span of six to nine months.